Cade Shepard on Barney Ross. Ted Petit Photography. First to ride in the second set, on Wednesday, April 10, the first day of go-round competition, Cade Shepard staked his claim as top contender with 222 points on Barney Ross, by Bamacat. Jaylee Hall on One Time Legend, by One Time Pepto, and Constance Jaeggi, aboard Sueper Trouper, by Dual Smart Rey, tied with 219 points, the second-highest score of the day, while Lisa Taylor, on Reycan In The Cash, by Dual Rey, earned 218, the third-highest score. Cade Shepard, the NCHA Non-Pro Hall of Fame earner of $758,602, showed Barney Ross LTE $29,465, to place twelfth in the NCHA Futurity Non-Pro Finals and also placed eighth in the finals of the 2109 Augusta Futurity Non-Pro, where his grandfather, Sam Shepard, rode the gelding as Open reserve champion. Sam Shepard also showed Barney Ross last week, as a Super Stakes Open Semi-Finalist. 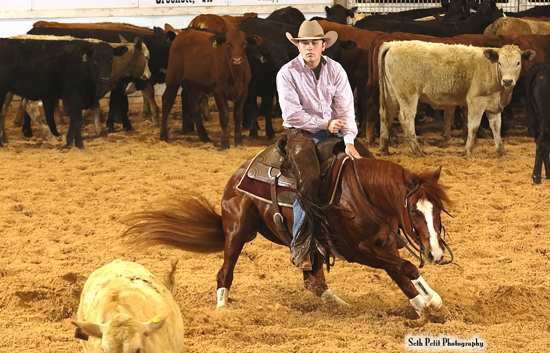 Cade Shepard won the 2015 NCHA Super Stakes Non-Pro championship riding Twistful Thinking LTE $280,813, who also carried him to win the 2015 NCHA Derby Non-Pro. Last December, riding Chexy Louella LTE $64,598, 17-year-old Shepard became the youngest rider to ever win the NCHA Futurity Non-Pro championship. Last month, he also captured the NCHA Eastern Nationals Non-Pro championship on the Im Countin Chex daughter. Jaylee Hall, the NCHA earner of $154,671, showed One Time Legend LTE 29,554 to win the 2019 Abilene Spectacular Non-Pro championship, and also claimed second-place money in the Bonanza Non-Pro Limited. Between 2014, when she was 16, and 2016, Jaylee showed High Brow CD Deuce, by High Brow CD, to earn over $127,000 as an amateur and non-pro limited event finalist. Constance Jaeggi, the NCHA earner of $660,046, is the owner of 2014 NCHA Non-Pro Horse of the Year Saguaro Ichi, by Cat Ichi, who carried her as NCHA Non-Pro World Champion, as well. Jaeggi’s Super Stakes mount, Sueper Trouper LTE $103,082, placed seventh last Saturday in the Open Super Stakes Finals under Grant Setnicka, and claimed second-place in the Novice division. Jaeggi showed Sueper Trouper earlier this year as Non-Pro reserve champion at Arbuckle Mountain, where Setnicka placed fourth in the Open. In 2010, Jaeggi placed ninth in the NCHA Super Stakes Non-Pro riding Kool Arista Cat LTE $70,598, by Cats Merada, and the next year, she won the NCHA Super Stakes Non-Pro Classic with Dual R Smokin LTE $203,627, by Dual Rey. Jaylee Hall, the last rider to show in the last set of the day, was also the high-scoring rider in the Super Stakes Non-Pro Limited division, where Duff Sinclair posted 215.5, the second-highest score, on Gimmeabreaklilkitty, by Kit Kat Sugar, and Ali Good earned 215 points with Sabrina Boon, by Boon A Little. The first go-round of the NCHA Kit Kat Sugar Super Stakes Non-Pro division concludes on Thursday, April 11. For complete results click here.